1) I understand the concept of testing different carbs for a BG response, but what about when we combine those carb sources with other foods? Won’t that change the response? For instance, maybe we have a poor response to white rice, but less of a BG spike when we smother it with coconut milk. Does this change how concerned we should be about eating white rice? 2) Some folks might argue that insulin response is as or more important that BG response. I’ve been checking out Marty Kendall’s site and I see he is looking at the insulin load of different foods. Is this as variable as BG? In other words, are the numbers on his site fairly accurate across the board, or does the insulin load vary person to person whereby one might have a bigger response to a Snickers vs. a slice of bread and vice versa? 3) I’d like to hear more about LPS and Bulletproof coffee and how we know if we fall into the group for whom fatty coffees are a bad idea. I heard Tommy Wood mention this on another podcast and I’m still trying to figure out if fatty coffee is always a bad idea or just a bad idea for some folks some of the time…and who are those folks? Thanks for all your work! I’m loving the book launch since I get to here you on several podcasts a week instead of having to wait a whole week to hear the next Paleo Solution Podcast! The carb test has you test these foods by themselves plain so you can get good idea of what that particular food does without many other variables. Yes, eating foods combined with other foods will make a difference, but eating the carb by itself will give you kind of a worst case scenario in a sense. That way you at least have an idea about how these different foods affect you, then you can go from there and figure out what works well for you when combining some of these carb sources with other foods in a meal and such. Just shoot your receipt to [email protected] and you can get the bonuses (except the Thrive Market one that has now expired). *Thrilled* to discover you live in Reno and even more excited to read the new book! Thank you for your engaging and enlightening talk today at Grassroots Books, such a treat! Wish we had more time to talk Taubes when you signed my book lol I love to geek out on controversial nutrition science. OMG… I read your first book. I’m 20-30 pages in on the new one…and I bloody LOVE it. Really enjoyed the Q&A as well as the book. I was interested in the part of the Q&A where you went of topic to discuss high AIC and working out with low carb leading to a stressor. Can you elaborate on this more including the solution as I am in this boat and was hoping to correct this situation. My fasting glucose is near the top of the normal range and so is my A1C but my fasting insulin is in the low range of normal. Any thoughts? I’d like to see more on this too. I started testing my glucose and was surprised to see my fasting glucose is always between 100 and 120, and it’s lower two hours after eating. My A1C is 5.8. I play hockey, which is basically HIIT, which would fit the profile Shanti Wolfe was talking about. Sorry I forgot to add I eat a lower carb diet between 50 and 100 carbs per day and train three times per work doing weights and one day per week of sprints along with casual walks around the neighbourhood. Wow! I am about three quarters of the way through the book. I recently switched to more of paleo(ish) diet from being pescatarian for about three years. I have noticed a huge shift in my energy and saitation. I confess that I am also very intrerested for both of my parents who have become curious about how to increase their health. Two questions have popped up as I’ve been reading the book. 1) You talk a lot about gut health and the lining of the stomach, Is there any way to tell what the quality of the your gut is? Specitic tests? 2) What are your feelings on stevia? You speak about hyperpalatable foods- sugar being one fo them, and how they can diminish our health. What are your thoughts on stevia health benefits/ costs? Does it keep our palate adjusted to sweetness and wanting more? Also, any studies you’re aware of that reveal how people’s blood glucose levels change when eating stevia products? Huge thank you!! So appreciate the work you are doing and passing the book along for sure! There are some tests, but you can also tell by symptoms as well. I am 80, in excellent overall health, good DNA (mom died at 106). My problem, paradoxically, is how to gain weight. I am 6’1″ and weighed 175 for several decades. I have cut out bread and most sugar over a few years, eating modified paleo, but gradually lost weight down to 145, not by intention. This is almost all muscle loss, although I continue to do short workouts with free weights. Will your program help me to gain weight? Confused on 7 day test. Do I eat normal breakfast of protein and add the 50g of carbohydrates or just eat the cArbohydrates? Just the carbohydrates by themselves with nothing else. 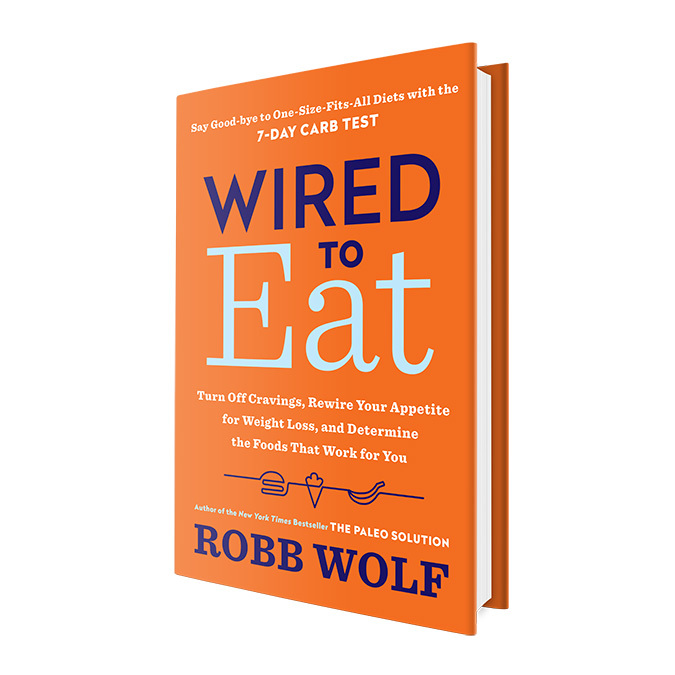 Loving “Wired to Eat” so far! A huge THANK YOU!! Looking forward to seeing what carbs I can tolerate in the coming months. My question is about fish/shellfish. It is such a large part of the paleo lifestyle, yet, I’m highly allergic. I didn’t realize how badly, because I just never ate it, until I was cross contaminated last year and my face blew up!! Took almost 2 weeks and a lot of drugs to be “normal” again. Do you have thoughts on “replacing” these essentials? Especially when it comes to the 30 day reset, but also on an ongoing basis. Yeah, definitely don’t eat fish/shellfish if you’re allergic. Stick to mostly grass-fed/pastured meats and eggs if you can and you’re probably good to go. You possibly could take a little algae based DHA for omega-3’s if you needed, but that might not be necessary. 1. Robb mentions butter (very briefly) as a source of fat that can be added but doesn’t mention other dairy. Is the 30-day reset dairy free (strict Paleo)? 1. Ideally, yes. Especially if you’re someone who hasn’t cut out dairy before to see how you react to it. 2. Not necessarily. It could be different from things in the same category. You can do more than 7 days and test more than 7 if you’d like, like you said there are many carb options to try. You can sometimes get a decent picture of what your blood glucose response is like after testing 7 different foods, but sometimes there can be outliers. Could it be useful to change the amount of carbs in the carb test based on the size of the individual, the intensity of their training, or the amount of carbs they’d usually eat in a meal? Or would you say that these parameters don’t affect the test too much? What about the first/second phase insulin response and the effect of net change in blood glucose? I’m aware this goes beyond the purposes of Wired to Eat, but testing glucose response as directed makes one begin to beg these questions. We recommend the 2 hour mark to make it simple, it’s kind of the standard for OGTT and diabetic testing, and it gives a good overall picture. If you want more data, feel free to measure more often if you’re willing and want to get a better picture of initial and prolonged response. Keep in mind in the study you listed that they’re testing FPG with IVGTT. Ok during the 30 day reset and general eating time it says the recommended amount of carbs is between 75-150g. Is this net carbs or gross carbs? I got a little confused because later with the test we need to use net carbs. Great book. Not sure if it has been answered or in the book. Do you first get a baseline fasting BG reading before you begin the 7 day testing? If so, how many hours should I fast? Thanks in advance. You can if you want more info. We’re just telling people to measure after the test meals to make it as simple as we can, but if you want more info you can test it as much as you want. If you wanted to get a fasted blood glucose reading, you would want to do it in the morning after you’ve slept overnight, at least 8 hours or more of fasting. Hi, I’m reading Wired to eat and wandering if I have to eat quantities of food on chapter 12 during 7 days test. It seems huge (onions, carrots etc. >600g ) do we have to eat this amount (50g net) i.e. 600/700g of food or less? Thanks a lot for sharing with us all this ! Question about the 7-day carb test. Here goes. My fasting glucose was 76. Consumed 50 effective carbs of white rice. At one hour, my BG had spiked to 175! At two hours it was at 135. So I retested at 25 effective carbs the next morning. Fasting BG on that day was 88, one hour post rice was only 112 and two hours was 114. I was surprised the two hour number was around the same as the one hour number. Anyway, in the book Robb writes that if the two-hour BG number is above 115, then the food at issue is probably not a good fit. But the converse is not necessarily always true, correct? In other words, given the massive spike the first time I tested rice, just because the second two hour test was at 114 dos not necessariy mean I should be eating sushi for breakfast the rest of my life, right 🙂 Thanks for any insight. After watching the FAQ video I’m a little confused about exercise. Is the suggestion to completely avoid exercise during the carb test? Thanks! I have the book on audible but was wondering about the accompanying PDF mentioned. I’ve searched but can’t seem to find them. Where can I get These list from? i live/eat really healthy (lchf but not too restrictive)..
what gives? is it a good or bad sign?? if your BG reading is lower after 2 hours, is that a good thing or??? yes sorry for the second comment..
i am now on my 4th day of testing and every carb i have tried has rised my BG (a little) at the 1 hour mark, but the 2hour mark has been lower than my starting point (fasting blood glucose). That is a good thing right?? Does it mean that i am insulin sensitive?? ..never forget Menckens quote about complex probs and simple answers. 1. Will the 7+ day test results be adversely affected if you eat excess calories (500-1500 onto of maintenance) while on a ketogenic or low carb diet for the 30 days prior to the 7+ day test? 2. Should we be testing food that also have a high fibre content for carb sensitivity, i.e. nuts, berries, low carb flours, etc? Jamie- If one is doing well on keto, not sure the test is valuable. If you do want to do it, i’d eat a modest amount of carbs for 5 days before starting, just to normalize all that. 2-It’s be almost impossible to reach the 50g of effective carbs in these cases. Even with cashews it’d be 1.25 CUPS! I’ve been conducting a load of N=1 experiments over the last 2 years generally cycling between KD, CKD and TKD, depending on the outcomes I want at the time. Luckily I went on holiday and had a little 2 week carb and calorie binge prior to starting the reset protocol! Re the effective carb volume, you’ll be disappointed to know that I’ve been consuming 2-3 cups per day of Macadamia, almonds and cashews (even blend) in one sitting! Combining with 85% dark chocolate it’s really not that hard even for a 68kg man ( my stomach did not thank me for it). I just wanted to confirm this volume (and/or the accompanying amount of calories) wouldn’t adversely affect the challenge phase. I am doing the 7-day carb test and started out with cold white potatoes. My fasting blood glucose was 91,8 mg/dl. My blood glucose after eating was 88,2 both at the 1 and 2 hour mark. What is your take on this? I know cold potatoes contain resistant starch and that the glucometer has some standard error. But i still didn’t expect this response. I’m actually a skinny guy and I’m reading Wired to Eat for general health, definitely not for weight loss (actually I need to *gain* weight as much as possible). So my question is about the snacks. Robb says we shouldn’t snack in the 30-day reset, unless we really feel we need it. But considering that I can’t lose any weight, I’d like to know if it’s ok for me to have some avocado or nuts in between meals *every day*, so that I can reach my calorie goal for the day. Yeah, definitely. If your goal is to gain weight, then don’t try to limit yourself unnecessarily. Thanks one more time for the wonderful job Robb and his team have been doing! 2. After I’m finished with the 30-day reset and also with the 7-day carb test: can I test some foods, following the steps of the 7-day carb test, anytime, even not doing a preparation like the 30-day reset (i.e. can I repeat the 7-day carb test in a moment of my life in which I’m not eating so correctly)? Yes, I would say you could do both of those things. If you’re already fasting and doing well with it and it’s something you do anyway, then you could try it on the 30 day reset too if you wanted to see how it went. You can do a carb test any time. It doesn’t have to be 7 days, it could be more or less, or intermittently at different times in the year, etc. So it means I don’t need to be on a paleo diet if I want to do a carb test, right? No, you don’t have to be. 2) After testing our individual responses to various carbs, would it make sense to test our response to carb with protein/fat combos and more go by that, sticking with the reading range recommended in the book? So I eat an apple with a healthy green sald with lots of healthy fats (olive oil, avocado, nuts) and get a lower response than with an apple alone, then can I go by that? Eg, apple alone yields reading above recommended range, but when combined with healthful foods, it’s okay, then would you recommend going by the latter, ie okay to eat if with other tested foods? In your opinion… if I’m underweight, trying to gain muscle (and perhaps even a bit of fat), and my fasting glucose is 93, should I try to bring it down? Hi Robb, after a few months on Zero Carbs, I noticed that I started having very low fasting blood glucose <60mg/dL, so I have introduced carbs as per your 7-day carb test. Now that I have a CGM (Freestyle Libre) I get a better overview of how I respond to various foods, but do you think one should be concerned about the immediate blood sugar spike – or is the 2hr measure the only one to focus on? I.e. I can have spikes up to 150-160 30mins after a certain meal of 40-50g of carbs (I also eat high protein, upwards of 70-80g per meal), but at 1hr it is usually below 120 and at 2hrs I’m always back to 80 or even lower. In fact, I’m apparently running 55-60 throughout the whole night but get a spike right around waking.